Search for the best flight prices from Manchester to Marseille. Compare prices, book today and save money with Manchester Airport. Travellers seeking a French city bursting with a fusion of history and pulsating urban sprawl would be hard pressed to beat the cultured municipal port of Marseille. Founded on a significant maritime heritage, visitors can observe the seafaring past with a trip to Vieux Port front, where fresh fish can be bought and enjoyed as a nourishing testament to the past. The city has attracted a range of inhabitants from all walks of life, lending to a diverse selection of world cuisines and a variety of cultural celebrations in ensuring this bustling city is a far cry from the sleepy dwelling painted in Cezanne’s artistic depictions. If downtime is required however, an inviting coastal area incorporates cycling tracks and sandy beaches as an escape from metropolitan reality. The sprawling southern French city of Marseille has a thick multicultural atmosphere, the product of centuries as an important maritime settlement. Its seafaring ambiance is best sampled around its handsome Vieux Port, which makes the 194-room InterContinental Marseille (1 place Daviel) – granting views over the port – an appealing option. Some 10 minutes’ walk away, the 13-room Music Hôtel (12 boulevard Salvator) is a three-star property with a contemporary feel, while the classy La Luna guest house (4 impasse de la Lune) draws plaudits for its infinity pool. On the city outskirts, Hôtel 96 (96 avenue de la Soude) is set in a 19th-century house. Marseille is the second largest city in France – only Paris covers a greater area – so it offers all the variety that this fact would suggest. The daily fish market on the Vieux Port gives a photo-friendly chance to cast your eye over the morning’s fresh haul, while the city’s leading market, the enormous Marché aux Puces (Avenue du Cap Pinède), offers everything from Provençal artwork to traditional fisherman’s sweaters. There’s a large Galeries Lafayette (28 rue Bir Hakeim) in the heart of town, well stocked with designer clothing, while upcoming French fashion label Sessùn (6 rue Sainte) has its own boutique. 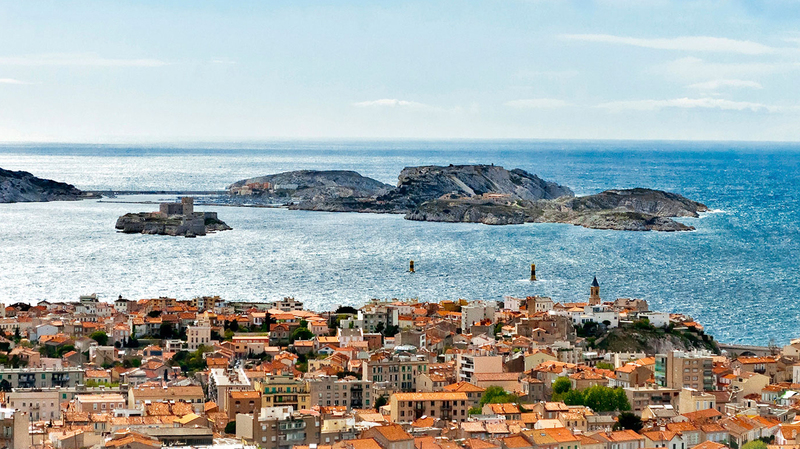 Marseille is synonymous with bouillabaisse, the fish stew traditionally made with the leftovers of the day’s catch. It’s become a much sought-after dish in its own right these days, with the gourmet version at Miramar (12 quai du Port) often named as the city’s best, although fans of the similarly lauded Chez Fonfon (140 rue du Vallon des Auffes) might beg to differ. The orange blossom-flavoured biscuits known as navettes – another Marseille speciality – are best sourced at the famous Four des Navettes bakery (136 rue Sainte), while for a drink with a view, head for the tiny portside balcony at La Caravelle (34 quai du Port). A nationwide event taking place in Marseille – as elsewhere – on 21 June each year, the Fête de la Musique sees a number of free concerts take place across the city. Timed to coincide with the summer solstice, it’s a great chance to enjoy open-air music. Throwing a spotlight onto the city’s cross-cultural roots, this festival gives a platform to various art forms, most notably dance and cinema. As well as a full roster of live performances, the event also incorporates workshops and meetings with the artists. Marseille’s international film festival has been running for close to a quarter of a century, showcasing quality cinematic works from home and overseas. It takes place in various screening locations, all of them clustered around the city’s historic core. The none-more-French sport of pétanque (otherwise known as boules) finds a focal point in Marseille each summer, when some 13,000 participants converge on the city for a mass international tournament. It’s free to watch and gathers large crowds. A celebration of art and live music taking place each October, Fiesta des Suds draws on a mixture of local and international artists and performers. Genres range from reggae to electronica, and there’s also a separate programme with entertainment for children.